I don’t know when I became addicted to subscription boxes, but it happened and I can’t let go. There is just something about getting a box of happiness delivered to your door that is so gratifying. 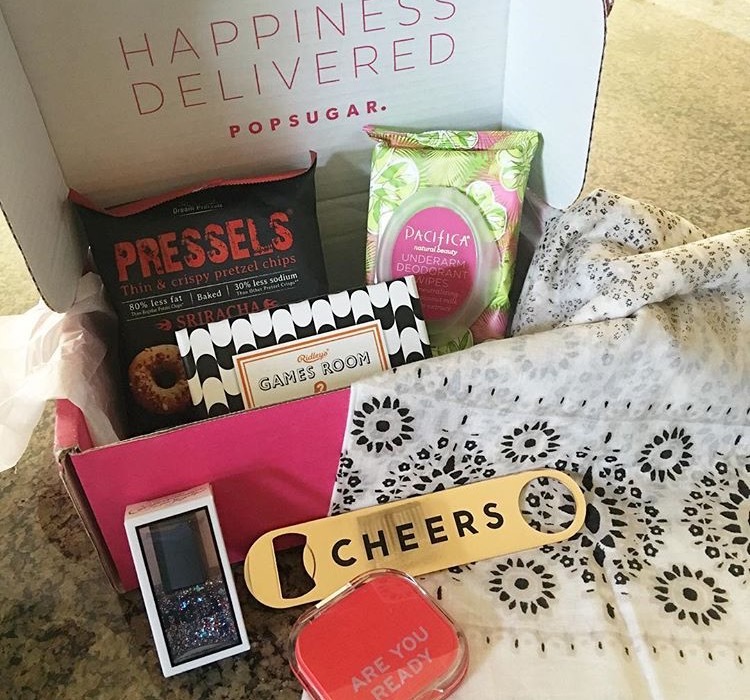 Currently, I have three recurring subscription boxes: Stitchfix, Foodstirs, and Popsugar Must Have. I’ll talk about these later because they’re obviously my favs to still be welcomed to my door (& wallet) each month. I have tried: Blue Apron, Hello Fresh, Little Lace Box, and Le Parcel. Okay guys Le Parcel was the WORST. That box is supposed to make ladies “time of the month” happier by sending you tampons/pads, chocolate and a gift. Well, it never arrived on the correct week, the chocolate was pretty much always melted and the gift was super cheap/tacky and something I’d never use. Also, I got the same hideous pair of sunglasses twice. No. Little Lace Box was cute. Their boxes were sent bimonthly, and had a theme that each followed. The gifts in the boxes were always thoughtfully picked and I was typically happy with everything in there. They chose themes like fairytales and old-age love stories, sooo I wouldn’t really understand them. Maybe I would’ve paid more attention in Literature class if my teacher told me I’d one day get subscription boxes based off these novels. I did enjoy this box, and ended up quitting it because they make their own beauty products/lotions/etc. and would always throw some of that in there, and I didn’t love that. But I did get a super cute vase from them, and they even included a gift card to a flower company so I got a “free” bouquet to put in the vase … that was my favorite. Stitchfix. I’d say this is probably one of the better-known of all subscription boxes. For $20, Stitchfix sends you a box of five cloth items per month. You can try them all on, and send back whatever you don’t want. The great thing is they make it so easy to send things back, they provide you with the postage bag and all you have to do it stick it in a USPS box. Whatever you keep, the $20 goes toward that, and if you keep all five items, you get 25% off (which is worth it if you’re keeping three or four, to just keep all). They have the best jeans. I despise trying on jeans in a store – they never fit. Stitchfix has magical jeans. They also recently got into sending shoes too, and I’ve found that I have loved the shoes they’ve sent me! I typically always keep at least one thing, to make my $20 worth it, but on occasion [like this month], I’ll keep the whole box…. Foodstirs. This is new for me, and I just got my first box this month. Very similar to Blue Apron & Hello Fresh, but for baking! Also $20/month, you get a box full of something to bake. Like the other food boxes, they send you everything you need except eggs/EVOO. This month is Halloween, so the box is mummy cupcakes. I haven’t made them yet – but will share when I do next week. I am excited to start baking more. I looked at some of their past boxes and they’ve sent cookies, pancakes, brownies, cake-pops – and they all look so cute and yummy! Saving the best for last…. Popsugar Must Have. This one is on the expensive side at $50/month, but I am obbbbbsessed. [They also have a Must Have Mini at $15/month] Pretty much all of my favorite things I own, came from this box. Each month, there are themes, such as “comfy, detox, organized” and they send you five items (and often throw in some extras) that go along with the themes. It always includes a beauty product, some type of snack, and realllly cute items that I’d never find on my own. Next Post What is Ulcerative Colitis?